Twenty five years later, We Are The World is back, this time with 80 artists and a corporate sponsor, VISA, the credit card company to which so many Americans are in hock. No one can quibble with the intent of this feel-good act of musical solidarity, or the obvious need it addresses. This is the third big star-studded help Haiti salute—MTV’s telethon shown on every channel, BET’s Miami-based largely black music salute and now this, the mega enchilada of big time charity fundraising events. It is star studded and sentimental, conjuring up memories, and echoing a mission that matters. An attempt was made this time to highlight the issue in the video itself—or at least the need—with photographs and images of the catastrophe and the children from Haiti, as well as upbeat cutaways of people in the rubble singing along. Haitian editors were flown in to work on it, and Quincy Jones and Lionel Ritchie stayed true to the original, even including creator Michael Jackson’s 1985 performance. Unfortunately, unlike the Olympics, this is not a really global initiative with “the whole planet singing along.” It is an A-list Hollywood happening. Where are the musical representatives of the world? There are few artists from Haiti beyond the omnipresent Wyclef Jean, who has lived in America since he was 9. Why no musicians from Asia, The Middle East, Africa, or closer to home, Jamaica, The Dominican Republic or Cuba? This is not just an entertainment or celebrity story. These artists are helping, perhaps the only way they know how by raising money. Some film stars have gone there and already contributed millions and, like Sean Penn, their time, to organizations that are on the ground. The danger is that we believe that’s somehow the money and the good intentions will solve all the problems there. Millions have already been raised but the aid program has been flawed, uncoordinated, and even now, a month after the earthquake, not moving fast enough with rain on the way, inadequate shelter and the dangerous spread of infectious diseases like TB and typhus. The disaster is actually deepening, leaving a suffering if strong people traumatized emotionally as well as physically. Only 7% of the needed tents arrived as of last week. The UN’s appeal for agricultural/food help had a poor response. More than a million people are still sleeping in the streets and many who have had amputations or operations do not have adequate aftercare. You could feel the agony of committed TV journalists like Anderson Cooper and Sanjay Gupta of CNN, who to their credit, went back to Haiti, but even their upbeat rescue stories often had depressing endings. We saw a young girl saved by doctors from a brain injury. The operation was successful but her family has nowhere for her to stay and cannot afford the medicines she needs. Will she survive? Where will she recover? How will we know? Reuters reports: “… a month later, the recovery is still largely in emergency response mode. And that’s in the Capital which has received most of the aid while those in other cities or the countryside have not. There is nothing controversial or angry about the new We Are The World, and that may be one off its problems because syrupy high profile celebrity events are now co-opted corporate-embraced commodities in our commercial culture. They are almost an expected Made in the USA genre, slick and all too often self-congratulatory commercials for compassion. They are effusively praised by the powers that be who pat all the high-profile artists on their heads, and then, in the end, ignore their passion. They also become one-shot stories and marketing vehicles. Entertainment and popular culture are moving and valuable but ongoing popular education on the issues is more important. As the news cameras pack up, why can’t some money be set aside to back the independent website Relief and Reconstruction Watch which is monitoring what is being done in Haiti. We need another professionally staffed website to insure public accountability and transparency on where all the money raised by international agencies, national governments and charities is going. We need funds to hire, empower and train Haitians to become the watchdogs. We also need media outlets to put more Haitian voices on the air, not just as singers but as spokespeople for a people who have lost so much and are being treated only as victims, not architects of the future they need to create. Haiti has to be in charge of what happens to Haiti. Reconstruction could take a decade. 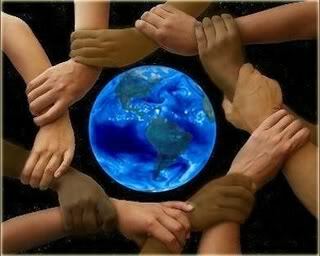 We, in the world have to demand that We Are The World not be the final statement on this ongoing tragedy. More stirring has been the grassroots response wordwide and the people-to people aid projects that also need visibility and our help. We need act-alongs more than sing-alongs.